For Valentine's Day in years past, I've worn red for the occasion, but typically I like to adorn myself in pink if I can. 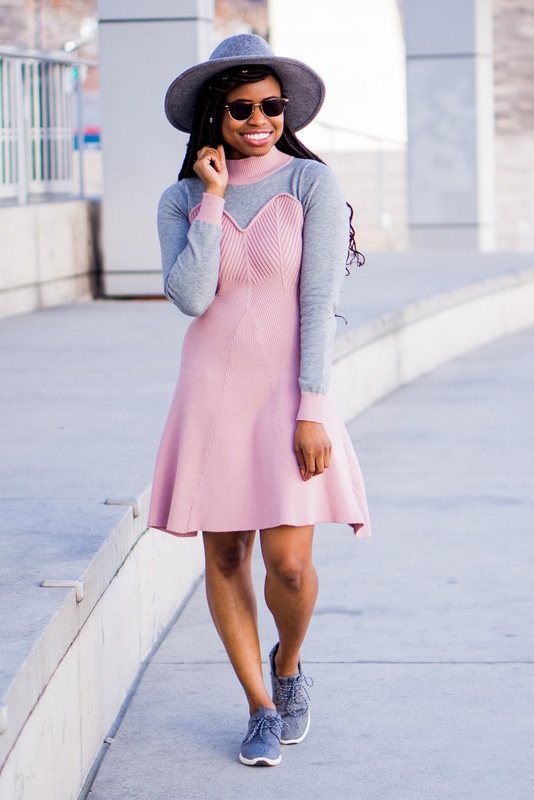 Last year, I wore this light pink ribbed choker sweater, and the year before I wore this super cute bows and stripes pink dress. 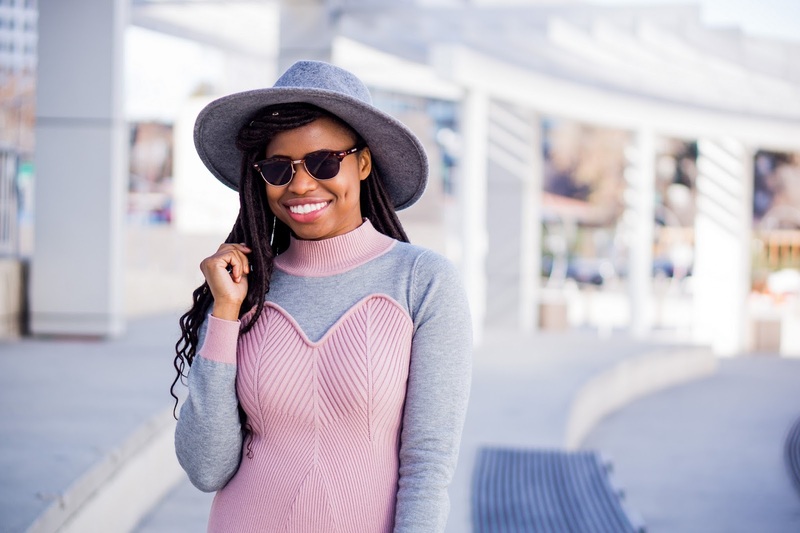 Today I put together a look featuring one of my favorite color combinations: pink and gray! I must say that when I got this dress from Chicwish, I thought it was going to still feel like winter here in the Bay Area. 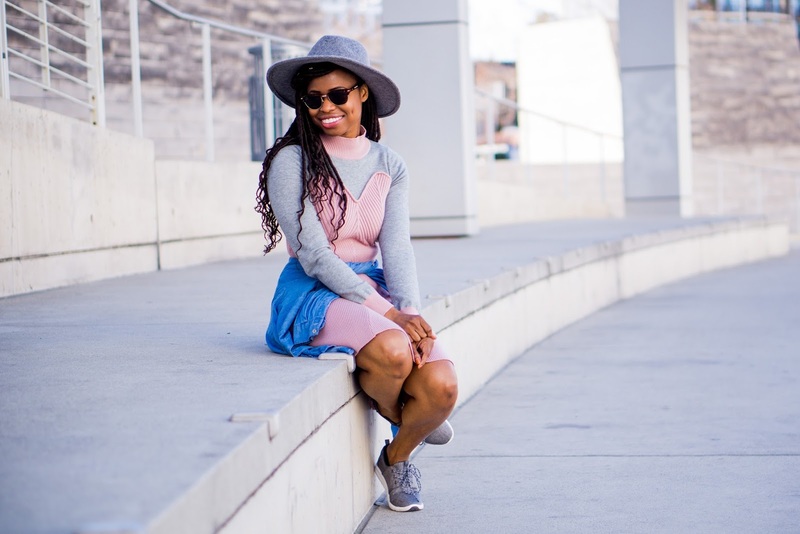 But it was like 70 degrees and sunny when I did this shoot, so thanks, pretty knit sleeves. It was really the sweetheart bust that made me think this dress would be great as a Valentine's Day look. I actually don't have anything big planned for the occasion, which is why I've kept the look quite casual. And comfortable, too! Seriously, the ribbing is awesome. 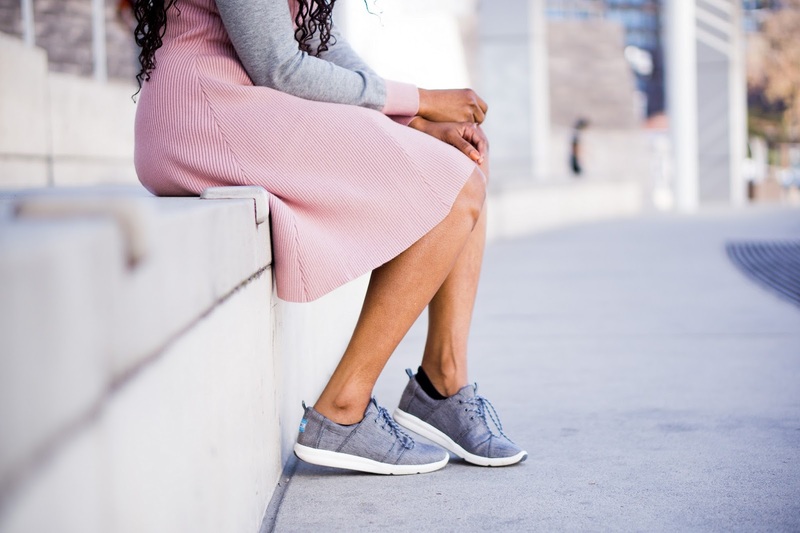 To continue the casual vibe, I paired the dress with these gray sneakers that I bought while in L.A. last month. Such a cute vday look, this is one of my favorite color combos. No vday plans here. I love pink and gray too! Crazy, stupid love was such an awesome movie. I also loved Amelie and need to rewatch it! Such a pretty dress! Happy V-Day! Really loving this whole look girl! It looks great on ya. We don't have any huge plans for Valentine's Day, just making pizza and cookies. Love the dress. It is super cute. What a cute dress -- I love how cute and comfy it looks!! Such a fun dress! My husband and I usually get some fancy sushi delivered for Valentine's day. Amélie is one of my faves as well! 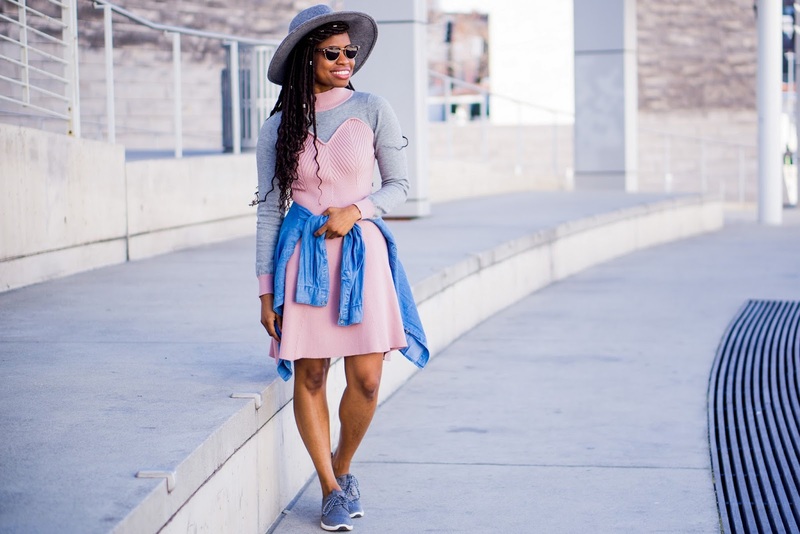 I'm loving this cute casual look, also loving the grey & pink color combo! We're def watching a good Valentine's day chic-flick! Oh I love the casual dress look... Especially colour themed for valentine's day. Your pictures make me miss the sun! Although I live in Spain it's been freezing for the last couple of weeks and I cannot wait to be able to wear dresses again! I seriously love the grey tones in this! Definitely a cute vday look for a coffee date. you look amazinggggggggggggg lady! LOVE IT! Super cute dress for V-Day and I love it on you. LOVING the layered look you've got going out! You totally nailed it! This is the cutest combo. Love the gray and pink together! And I'm single AF lol so pjs it is. Loving the pink on you!! Happy Valentine's Day! I am so jealous of that sunshine and temperature! Today was 27 degrees in the morning. I love the dress and the layered look! I love the blush dress- it's way gorgeous! And sneakers, yes ma'am! So chic and cool. This is such a sweet little look, Cheryl! I totally love that sweetheart neckline too. Such a flattering finish to the dress! I haven't seen 10 Things I Hate About You in ages!! I should re-watch ahah! Such a chic and sweet look! Such a lovely outfit you got there dear. It looks so chic, yet looks really cozy too. Also, pink looks great on you. Pink and grey look so very good together C !